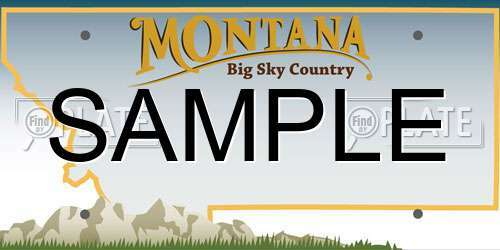 All vehicles in the state of Montana must be registered with the Motor Vehicle Division. When you register your vehicle you can choose from a Standard Plate, Specialty Plate, Personalized Plate, or Disability Plate (if eligible). All residents and out-of-state workers living in the Montana must register their vehicles at the Motor Vehicle Division (MVD). Quarterly Registration: For non-residents and out-of-state workers in Montana. Permanent Registration: This is only available for vehicles 11 years and older. You will never have to renew the vehicle’s registration unless it is sold. 12-month Registration: Valid for the duration of 12 months and requires payment of all fees including taxes. 24-month Registration: Valid for the duration of 24 months and requires payment of all fees including taxes. The MVD provides you a standard, state license plate. The style of the license plate changes every 5 years. Alternatively, you can choose from a variety of specialty license plates associated with local organizations, charities, and occupations. Most plates can be personalized with a custom plate number as long as the state’s guidelines are followed. Note: Specialty plates have fees in addition to the standard plate registration fees. For example, some sponsored plates require a donation, administration fee, and a plate production fee. Contact a MVD office for more details on speciality plates. The decision to process your personalized plate is made by the MVD. You’ll be required to explain the meaning behind your license plates. Alternatively, if your vehicle is 11 years or older, you can apply for permanent plates which never have to be renewed. Upon successfully renewing your vehicle, you’ll receive new registration stickers to apply over the old ones on your rear license plate. Should you apply for new plates (such as personalized or specialty plates) you must surrender your old plates. You can surrender your Montana license plates either by dropping them off in person or mailing them in. Your license plates remain in your possession if you sell, donate, or auction your vehicle. When you buy a new vehicle, you can transfer them over. Otherwise, you will be required to surrender your plates if they are not to be used. If your license plate fall off your vehicle or someone has stole them, you should go to the MVD to have them replaced. You must apply for replacement license plates in person. If your plates have been stolen you’ll have to submit a sworn statement. You should also submit a police report to ensure your license plates aren’t used and abused by others. Please contact your local MVD office for more information about the fees required for your vehicle’s registration. If you require personalized plates and what to see which plate numbers are available, you can look up license plates online. You can also look up license plates to see the history of a vehicle, such as whether the vehicle has been stolen or not.